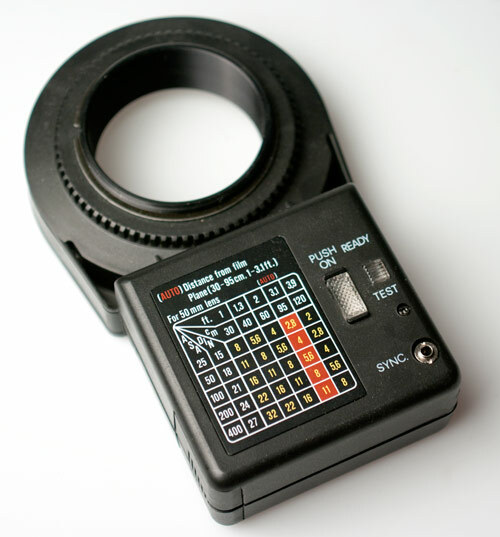 The Centon MR20 Ringflash was a brand sold by Jessops in the 90s that was the same as the Vivitar 5000 and various other brand names from the likes of Cobra and Starblitz . It’s a fairly low power, basic unit but the price makes it an affordable entry into the world of ring flash photography. The back panel has an on/off button that glows green to show power on, a ready light that glows orange when the ringflash is charged and this doubles up as a test button. There’s also a 2.5mm sync socket for the flash sync cable and an exposure scale. On the front is an auto/manual switch. If you set to auto, the sensor on the front of the flash cuts the power so it’s correct for the auto aperture that’s been selected. You determine which aperture to use with the scale on the back. The auto range os 30-95cm and f/5.6 at ISO100. The scale has a series of flash to subject distances along the top from 30cm to 120cm and a series of ISOs from ISO25 to ISO400 down the side. To work out what aperture to use you read along the ISO row you’re using and follow down from the flash to subject distance. So looking at the scale a photograph taken 40cm from the subject at ISO 100 would need f/11 setting on the camera. 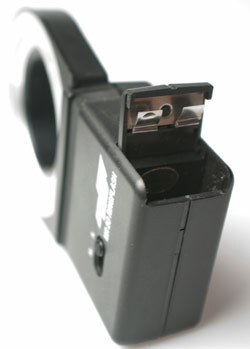 The flash works equally well with film or digital cameras and is powered by two AA 1.5v batteries. 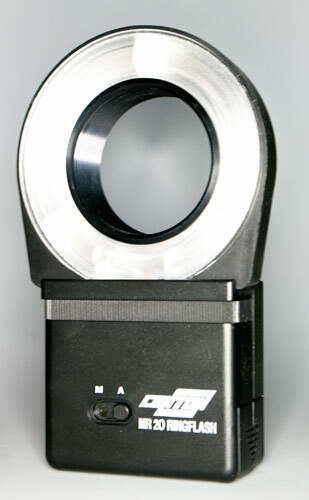 It attaches to the camera lens via the filter thread and uses Series VII rings to obtain the necessary filter thread size. If the Series VII ring you need is not available you can use step up/step down rings to take it to the correct fitting. When sold new the flash came with 49mm, 52mm and 55mm adaptors.